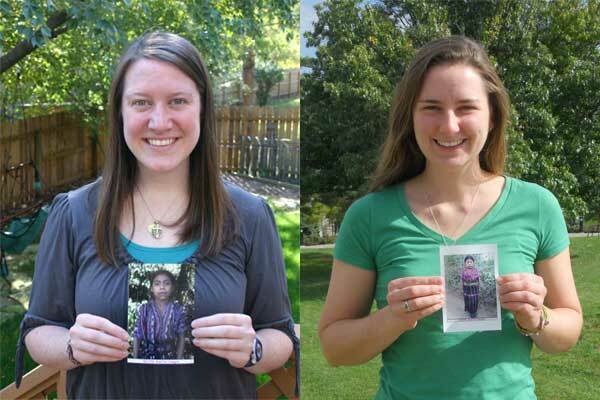 Briana, left, and Megan, right, hold photos of Ana, the child they’ve sponsored together for more than four years. Best friends Briana Murphy and Megan McLaughlin wanted a way to stay connected when they graduated from high school and went away to different colleges. They also felt motivated by their faith to contribute for the good of others, so they decided to sponsor a child through Unbound as a way to do both. Briana and Megan sponsored then 7-year-old Ana from Guatemala. That was more than four years ago. The young women graduated from college and are pursuing new adventures now, but their support of Ana remains constant. “It’s good to see the benefit that our gift is having for someone else in the world,” Megan said. Briana and Megan have been best friends since they were pre-school age, living in the same cul-de-sac in a Kansas City suburb. Megan noted that she’s known Briana longer than her younger sister. Working together to help a child who needed their support seemed like a natural thing to do, and it’s worked out beautifully. They split the monthly financial contribution and both write to Ana to offer their encouragement. They chose a child from Guatemala because their parish, Holy Trinity in Lenexa, Kan., has a relationship with a parish in Guatemala, and they wanted to learn more about the culture. Briana felt the embrace of Ana’s family toward her and Megan. She’s enjoyed learning details of Ana’s life such as how she likes to help her mother in the garden and with chores around the house. Briana’s also noticed how grateful Ana and her family are for the smallest of things, like the pencils and coloring books she and Megan sent one Christmas. Megan noted the prayerful aspect of sponsorship as something she appreciates. She and Briana pray for Ana and her family and share that in their letters. Ana’s family also lets them know of their prayers. For Megan, sponsoring Ana reminds her to rely on God. While Briana and Megan plan to continue their sponsorship of Ana into the future, the financial responsibility will soon fall solely to Megan, a veterinary medicine student, as Briana prepares to enter a community of missionary sisters. “I’ll still be praying and hoping to send her some letters,” Briana said. Start your own special relationship. Sponsor today.